Uri Shinar is looking for a hit. But the CEO of animation website aniBoom (see earlier TechCrunch coverage here) thinks he can find one by creating a platform for talented, aspiring animators worldwide. A former Israeli-TV bigwig, Shinar is credited with helping to establish Israel’s No. 1 commercial TV station. Now he is trying to lay the foundations for a Web-based animation studio with aniBoom, and move it beyond the “YouTube-of-cartoons” pigeonhole it occupies today. Shinar has produced quite a bit of television programming and along the way gained a hands-on appreciation for the cost, complexity and luck needed to develop and execute a financially lucrative success. This is why he sees the Web as the ideal incubator to form an animation studio driven by user contributions. On Monday, he is planning to announce an advisory board that includes John Mass (head of corporate development and new ventures at the William Morris Agency), Peter Hirshberg (chairman of Technorati), and Barbara Corday (the TV producer who created Cagney and Lacey). The charming creature pictured at right is none other than Crazy Frog, aka, “The Annoying Thing”. Check out this video to get a taste of the frog and to hear the sound that launched an international merchandising bonanza, especially in Europe, Australia, and Japan. It is not an aniBoom animation, but it the type of content Shinar wants to help discover or produce. When the worlds of animation, licensing, and merchandising collide, a big hit translates to big, big bucks. In this sense Crazy Frog embodies everything that aniBoom is striving for. In 2005, the Crazy Frog franchise made over $79M through the sale of mobile ringtones alone. 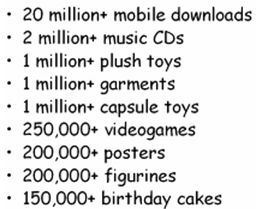 Now look at the cumulative merchandise sales estimates on the left and it becomes evident just how much money a single hit can generate. Do the math and ask yourself how many startups you can name that generate such sales figures? I bet many of you are scratching your heads real hard right now. 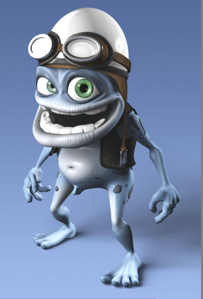 The crazy thing about crazy frog is that there was no master plan behind its making: In 1997, a Swedish teenager recorded himself impersonating a two-stroke engine and then uploaded the recording to the Web where it began spreading virally. In 2003, another Swede added the animation featuring the Crazy Frog character. A year later, a German company called Jamba! licensed both sound and animation and the phenomenon was scaled to a sensation. Shinar recognizes there is no shortage of artists with the talent, creativity, tools and technology to create first-class animation. However, what these artists don’t have is industry access and the ability to scale. In essence, aniBoom has created a “digital pipeline” that bridges the gap between the need for cost-effective development and production, and a global pool of resources—to date, aniBoom has recruited a couple of thousand animators from 70+ countries. It’s this digital pipeline that allows aniBoom to find, develop, test, produce and distribute at a pace that is far faster than the traditional (offline) animation production process and at a much lower cost of course. Take “The Race for the White House”. The series was produced by creators from the US, Bulgaria, India, Croatia and Israel, with the scriptwriting and vocal talent of Gabe Abelson who was the head monologue writer for the “Late Show with David Letterman”. Another series titled “Animal Nation” which I’ve been shown but has yet to debut, was produced by a single creator from Mexico. He pitched the idea to aniBoom which then assisted with the concept, writing and animation-to-music work. Or check out Mr Coo, a surreal video created by a 22-year-old animator from Barcelona, Spain (embedded below). For a co-produced series, aniBoom pays creators $20-25K for a development deal and 30% revenue-share across all platforms, including television. Revenue-share for merchandising is negotiated on a case-by-case basis. In 2008, aniBoom plans no less than 20 co-produced series. But Shinar is still looking for his first big hit. AniBoom’s website only attracts 770,000 unique visitors a month. Yet Shinar seems somewhat indifferent to his site’s lack of traction so far. Unlike your typical traffic-obsessed 2.0 CEO, Shinar is focused on increasing the value of aniBoom’s content depot, rather than its immediate ad revenue potential. Content is truly king to him and the distribution channels are just interchangeable conduits. That said, aniBoom has struck distribution deals with the likes of YouTube, Joost and Yahoo. The history of Crazy Frog is important here because to a large degree aniBoom is attempting to morph a series of lucky accidents into a pitch-to-production methodology. Back in 1986 when Steve Jobs bought Pixar, few could foresee that it would become an animation powerhouse. On the Web, incubation periods are accelerated and it is easier to test the waters with animation shorts. If the stars line up just right, aniBoom could become a real player in animation much quicker. But first it will have to find its frog.